Photo courtesy of Andrew Bullington. Found on a child in Zhoushan, China. And I assume on the front is a picture of Homer Simpson. I’m sorry, but I have not yet stupided enough today. Stupid more, step one: buy this T-shirt. I stupid. Therefore I’m not. I bet her shirt’s on backwards. This may not be Engrish. It could be a joke on that cliche – Think less, do more. Like the way that guy in the background is holding his child. Stupid is as stupid does. Thank-you Forrest Gump. Damn “a” not “s” Imshallah. Haha Marum. God, is God is God, is truth. I’lll bet he is out to get you for that. Haha Marum. God, is God, is God, is truth? He may be out to get you for that one. I can understand this T-Shirt. I’m a failed protestant. I can’t remember the words to Kunbaya. Kumbaya. Hell Marum! You’ve caused a curse to descend upon us. 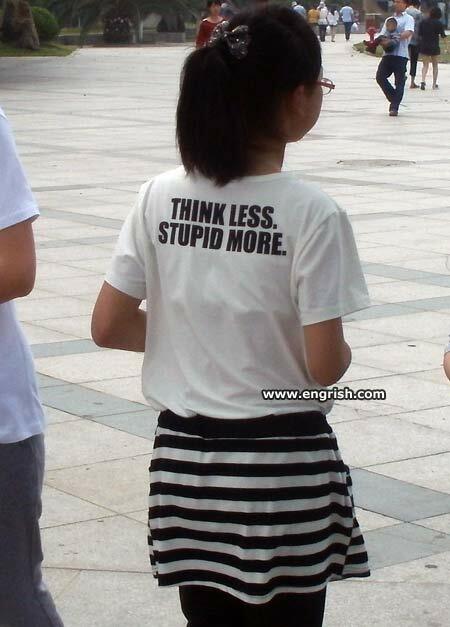 I don’t think, therefore I am…stupid. One of the rejects from the Stu Pidmore summer range. If so many politicians would quit hogging the current supply of stupid, we wouldn’t need campaigns like this. Think is the curse of the stupiding class. Now class, would everyone please conjugate the verb “stupid” in the present tense? To err is human. To eat dog waste on camera is Divine. And in retrospect, probably a bit stupid. Salome: The noun form is “stupidiot”. While you’re at it, you may as well go deaf and mute. I’m too stupid to think of anything for this post. Neatly reflects that nation which is claimed to have the greatest bowel in the Universe.